Embroidery is a wonderful kind of art. You take something somewhat plain looking and by adding just one relatively small detail to it, you transform it into something beautiful and unique, worlds apart from the base on which it was added. Whether it’s done by hand or with the help of an appropriate sewing machine, once it’s applied to a project it drastically increases its values in both artistic, as well as the material sense. Doing it by hand however, has its flaws. It takes a lot of time and patience because of which it can be physically demanding, but it also limits your creativity to a certain degree when compared to embroidery done with a sewing machine. 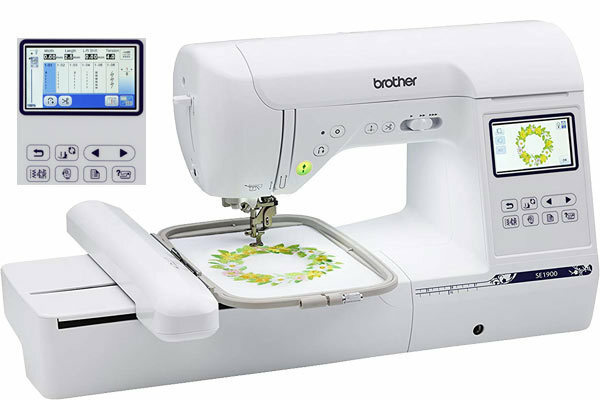 So if you want to dive into a world of embroidery or if you just want to switch from doing embroidery by hand to doing it with a machine, stick around and take a look at the Brother SE1900 sewing machine we’re about to review. Embroidery machines usually do a solid work when it comes to regular sewing projects but they are after all advertised as specifically suited for embroidery so they naturally perform the best at that kind of tasks. However, this model is a bit different. Despite the fact that its main purpose is embroidery, it’s designed so that it creates embroidery works of art from scratch. Literally. A wide variety of functions and features this machine possesses offer you a chance to make various kinds of apparel, clothing accessories, home decor and more. You can then decorate all that with amazingly beautiful embroidery, thus creating a proper unique, creative and interesting works of art. As mentioned, the machine boasts a fair number of capabilities so let’s have a look at those specifications and see what exactly can it do and how. If you want stitches, you’ll get stitches. 240 unique built in sewing stitch types of which most are decorative, providing you with a lot of customization possibilities. With the help of My Custom Stitch function, you can also create your very own stitch type and save it on your machine’s internal memory so you can use it later on whenever you want to. Automatic needle threading allows you to quickly and easily thread the entire machine with a touch of a lever, cutting your preparation time considerably. Automatic thread cutter cuts your thread for you, allowing you to wrap things up faster. Embroidery designs. Sweet old nana would fall off her resting chair if she saw the 138 embroidery designs you can make with this machine. These designs consist of floral and seasonal designs as well as ten frame styles and fourteen stitch patterns. By using the 3.2” brightly lit LCD touchscreen, you can edit all of them to your liking before sewing them on. Elongate, rotate, flip or just change the colors, change them however you want to. USB capability. If you don’t like any of those designs or if you got tired of them, plug a USB stick with your own original embroidery design on it into the machine and start needling. You can also purchase some new ones online and then transfer them the same way if you don’t feel like coming up with your own kind. Apply different kinds of buttonholes on your wardrobe with ten one step automatic sized buttonhole styles. “Property of Her Royal Highness the Queen.” Write out letters on fabrics in seven English fonts such as script, serif, outline and more. The machine can even write out words in two Japanese fonts and one Cyrillic font. Eight different included presser feet offer you a possibility to create various kinds of sewing projects while using fabrics of varying characteristics like thickness or toughness. Presser foot pressure is adjustable which means you can work with even the finest and thinnest kind of material like silk or satin. Free motion embroidery. Expert embroidery and quilting enthusiasts will enjoy the free motion embroidery function. This allows you to basically write whatever you want with the thread. High precision and creativity skills recommended. Large work area. The work area is quite spacy, being five inch wide and seven inch long, providing you with enough room to fit both smaller and bigger sheets of material and work them with ease. LED light is bright enough to illuminate whatever you’re creating even at nighttime. Dark fabrics shouldn’t cause you any troubles either, all thanks to this. Also, it will help you to be more precise when sewing on embroidery patterns and designs. Brother SE1900 will stay by your side for a long time, don’t worry. 25 year limited warranty included. Inside the original packaging, along with the machine itself, you’ll be getting the eight aforementioned presser feet. They consist of a buttonhole foot, an overcasting foot for making professional edges, a monogramming foot for decorations, a zipper foot, a spring action zig zag foot great for sewing over multiple layers of fabric, a blind stitch foot, a button fitting foot, and of course an embroidery foot. If you like the thought of doing sewing work for customers from the comfort of your home, then it might not be bad idea to consider getting this machine for that purpose as it is our best embroidery machine for home business. This model is a combo type sewing machine which means it’s specialized for one job and it does that job very well but it also can do other kinds of sewing work, producing good results while doing so. If you decide to start a mini sewing business and to use this machine for it, you’ll be able to provide your customers with both creative and unique products made from scratch, or improved versions of pieces they themselves brought to you. However, you will also be able to do the quick repairs of wardrobe that most people need when they seek help from sewing practitioners. This means you’ll have a broad spectrum of potential customers in your endeavor. Mind you, if you do start such a business you will have to commit to it and designate a certain amount of time in your daily life for it. And since this machine comes with a hefty price tag, you’ll have to think hard and well before you come to a final decision. Two major downsides are obvious from the get go in this case. The price of the machine and the fact that it’s fully computerized. Let’s be real here for a second. The money you need to spend in order to buy this model would be enough to buy three solid sewing machines instead. Would those three machines be good? Yes. Would they be able to do the same kind of work this model can? No way in heck. But they would be good at other stuff, just not embroidery and similar decorative work. Nor would they have such customization capabilities. But your pocket wouldn’t completely deflate. The second downside is the fact that this machine is fully computerized. Now this isn’t a downside by itself. But put a malfunction with it and you’re in a pickle. Repairs of computerized sewing machines take a lot of time and they can be pricey if you don’t have a warranty. You also need to find a certified repairman because not every sewing machine repairman can fix a computerized model. Brother SE1900 is a fine embroidery machine indeed. It offers a lot of designs and patterns along with the possibility of creating your own unique stitch and embroidery design. It is also good at regular sewing work with various kinds of materials. But it’s quite expensive and that is a potential deal breaker for a lot of sewing enthusiasts. Also, if it malfunctions you’ll have to wait for a while until it gets repaired. Is it a good choice for you though? That’s up to you to decide but if you have the budget necessary, then why not?